If you have shoppers, workers or order picking in the aisles, it's only a matter of time until an accident occurs. 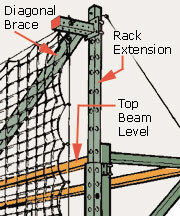 Don't let it - deploy rack netting to "stop the drop"
SAFTNET-4101575 9'4" x 12' 4,000 lbs. 4" x 4"
SAFTNET-4101550 9'4" x 12' 2,500 lbs. 2" x 2"
SAFTNET-4101576 9'4" x 16' 4,000 lbs. 4" x 4"
SAFTNET-4101551 9'4" x 16' 2,500 lbs. 2" x 2"
SAFTNET-4101577 9'4" x 20' 4,000 lbs. 4" x 4"
SAFTNET-4101552 9'4" x 20' 2,500 lbs. 2" x 2"
SAFTNET-4101578 12'4" x 12' 4,000 lbs. 4" x 4"
SAFTNET-4101553 12'4" x 12' 2,500 lbs. 2" x 2"
SAFTNET-4101581 12'4" x 16' 4,000 lbs. 4" x 4"
SAFTNET-4101556 12'4" x 16' 2,500 lbs. 2" x 2"
SAFTNET-4101582 12'4" x 20' 4,000 lbs. 4" x 4"
SAFTNET-4101557 12'4" x 20' 2,500 lbs. 2" x 2"
SAFTNET-4101579 20'8" x 12' 4,000 lbs. 4" x 4"
SAFTNET-4101554 20'8" x 12' 2,500 lbs. 2" x 2"
SAFTNET-4101583 20'8" x 16' 4,000 lbs. 4" x 4"
SAFTNET-4101558 20'8" x 16' 2,500 lbs. 2" x 2"
SAFTNET-4101585 20'8" x 20' 4,000 lbs. 4" x 4"
SAFTNET-4101560 20'8" x 20' 2,500 lbs. 2" x 2"
SAFTNET-4101580 25' x 12' 4,000 lbs. 4" x 4"
SAFTNET-4101555 25' x 12' 2,500 lbs. 2" x 2"
SAFTNET-4101584 25' x 16' 4,000 lbs. 4" x 4"
SAFTNET-4101559 25' x 16' 2,500 lbs. 2" x 2"
SAFTNET-4101586 25' x 20' 4,000 lbs. 4" x 4"
SAFTNET-4101561 25' x 20' 2,500 lbs. 2" x 2"
You must choose a mounting system, and it depends on your load characteristics. You can choose Flush or Offset Mount, dependent on the depth of your load. You can also choose extensions so that you can protect pallets stored on the top beam level. 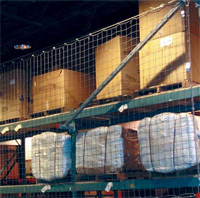 See Pallet Rack Safety Netting Mounting considerations for more details.